This well-equipped hotel features a free breakfast free in-room high-speed internet access an outdoor pool and more. La Quinta Inn & Suites Overland Park houses 143 non-smoking rooms on three floors. Each room is equipped with free high-speed internet access a microwave refrigerator premium cable channels coffeemaker and hairdryer. Each morning partake of a complimentary breakfast including waffles hot and cold cereal pastries fresh fruit coffee and juice. 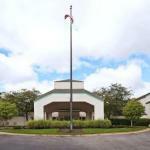 Also enjoy a seasonal heated outdoor pool 24-hour fitness center and business center. Guest laundry facilities are also available. With easy access to I-435 La Quinta Inn & Suites is close to the city's top attractions and businesses. The Overland Park Convention Center is a half-mile away and offices at Corporate Woods Office Park and the Sprint World Headquarters are only a mile from the hotel. Truman Sports Complex is 17 miles away and the Kansas Speedway is 20 miles away. The Kansas City International Airport is 35 miles north of the hotel. Dogs of all sizes are allowed for no additional fee; there is a pet policy to sign at check-in. Dogs may be left alone in the room if they will be quiet and well behaved.